Otokar, leading supplier of the Turkish Military and Security Forces for tactical vehicles, is attending Shield Africa, International Security & Defense exhibition in Côte d'Ivoire, between 21st & 24th January. Otokar, a Koc Group Company, with over 30 years of experience in military vehicles, participates in Shield Africa International Security & Defense exhibition in Abidjan, in Côte d'Ivoire. During the exhibition, Otokar is promoting its own design armored tactical vehicles as well as turret systems. Stating that Otokar armored vehicles have been serving in 32 countries, Serdar Görgüç, Otokar General Manager said: “Otokar continues to strengthen its position in the international defense industry with its technological superiority, engineering power, design capabilities and over 30 years of experience in military vehicles. The success of Otokar’s armored vehicles has always been a reference for new orders. Today, more than 30 thousand military vehicles designed to meet user expectations and needs against present day and future threats are actively used in several different missions in Africa, Asia, the Middle East, and Central Europe. “Africa is among our principal markets and we aim to increase our presence in the continent. This is our first attendance in Shield Africa exhibition and we believe it will be a good opportunity for us to reinforce our relationships in this sense,” he noted. 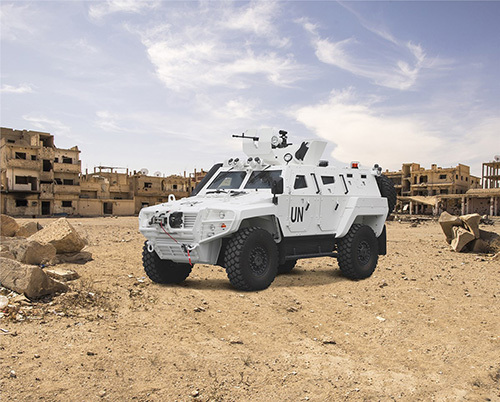 Serdar Görgüç underlined that Otokar as a registered NATO and United Nations supplier is delivering the best vehicles with modern equipment in line with the specific needs of users in Africa. “We have been able to gain significant experience about responding to the needs and expectations of this region through the military vehicles currently serving here. Otokar has also started to stand out in global scale not just for its products with fully-owned intellectual property rights, but also with its know-how, engineering, R&D and technology transfer capabilities. In addition to promoting our broad product range during the exhibition, we will also look for the new opportunities including technology transfer,” he added. Otokar stands apart with its expertise in the design, development and system integration of all kinds of vehicles and platforms in the field of land vehicles for the defense industry. Otokar designs and manufactures a wide range of tactical armored vehicles including 4x4 URAL, COBRA, COBRA II, KAYA II, ISV, ARMA 6x6 and ARMA 8x8. Otokar products are recognized for their survivability, superior tactical and technical features and high ballistic and mine protection. The vehicles serve various types of missions including border patrol, fighting vehicle, command post, reconnaissance and similar. Otokar’s TULPAR tracked armored vehicle family is designed as a multi-purpose vehicle platform with its significant ballistic and mine protection and superior firepower to support new generation main battle tanks in battlefield and also for providing fire support for infantry. TULPAR’s high power to weight ratio, all-terrain high-performance suspension and automatic track tensioning system offer superior mobility in diverse terrain and climatic conditions. Otokar, as the prime contractor of ALTAY main battle tank development project of Turkey, has a unique experience in main battle tank design and development projects. With the expansion of its vehicle family, Otokar turned its focus on turret and weapon station developments. With almost 30 years of knowledge and expertise in turret systems design and integration, Otokar developed MIZRAK, BOZOK, BASOK, UCOK and KESKIN remote controlled turrets ranging from 7.62 mm to 30 mm. With its high-performance, high-tech turret systems, Otokar aims to strengthen its platforms and gain competitive advantage in the world.